The market leader in negotiated transactions specializing in the business forms, labels, envelopes and commercial printing industries. POS Professional Office Services, Inc. (POS) specializes in the manufacture and marketing of printed business forms, filing systems, and related products to health care professionals and businesses. POS services more than 26,000 customers nationwide and began operations in Waterloo, IA in 1970. After learning that Sage might be receptive to a possible divestiture of SOLION we presented but one company to Sage as a potential acquiror...POS. 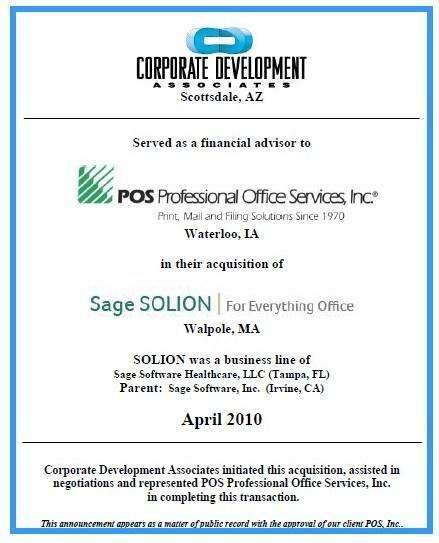 Sage was delighted to have divested a business unit to a synergistic acquiror like POS...and POS was most happy to enhance their position in the Northeast by adding a location in Walpole, MA. Updated last on 12/27/18 at 5:07PM EST.